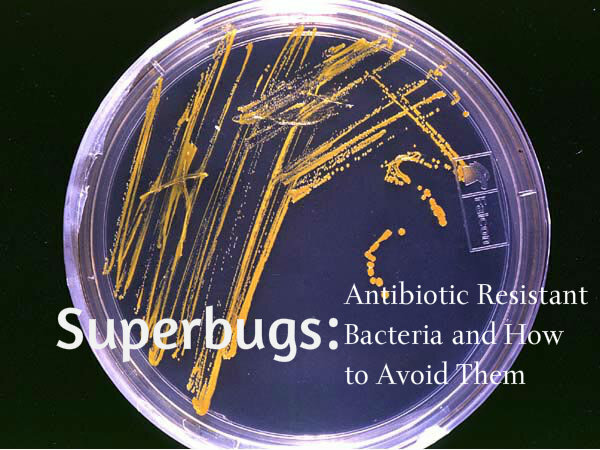 Most people have heard about superbugs. But what exactly are they? I’ll do my best to briefly explain what they are, and how we all can do our part and prevent them from spreading, and even sometimes, prevent them from even coming into existence. We all know that bacteria exist, but what a lot of people don’t think about is that they can change in future generations. And by ‘change’ I mean they are capable of natural selection, just like us bigger organisms. Natural selection is simply the process by which organisms better suited to their environment tend to survive and produce more offspring. Now for us, it takes a longer time for us to see generations turn over (you know, about 40 weeks to make a baby, and that baby will take years before they can make a baby of their own. It takes a long time). For bacteria, that’s a different story as they can multiply much faster than we can so changes happen that much faster. In some cases, it can take just a few hours to have several new generations. This is one way we wind up with antibiotic resistant bacteria. Once a population of bacteria are exposed to an antibiotic, the vast majority of them will be killed off, but nothing is 100%. And those couple that could possibly survive, did for a reason. They had some characteristic (like a certain gene) about them that allowed them to survive and if given the chance, they will reproduce and pass that trait on to their progeny and continue to cause trouble. And how do bacteria get these genes in the first place? One way is by exchanging genetic material with each other (horizontal gene transfer) and another is through viruses that infect bacteria (bacteriophages or phages) and pick up genetic material, passing it to other strains of bacteria (something like a how bees spread pollen). This video from Harvard Medical School shows how bacteria can become progressively resistant. What makes them so dangerous? Well these bacteria are free to cause all the havoc they want. Their ancestors were already difficult for us to fight, which is why we had an antibiotic against it in the first place, but now they have a way around this too and consequently they are more likely to get out of control and cause serious illness. See what keeps happening? It’s a definite problem that needs to be stopped. The overuse of antibiotics– the beginning of the era of antibiotics was not as long ago as we think although most people do not remember a time without them. Their effectiveness at treating such a wide spectrum of infections was of course looked at as a miracle, and it was and still is. However this lead to over use in every arena of life. You can hardly find a place that antibiotics aren’t used in. In the soil, in meat we eat, water we drink. Not to mention doctors prescribing them unnecessarily and patients that did need them not finishing their courses completely since they often feel better so quickly. The problem with this is that every unnecessary or improper use of antibiotic gives the bacteria a chance to mutate into something stronger and more resistant. Travel– the convenience we enjoy of being able to travel by air to any corner of the world in only hours is also convenient for bacteria too. New strains of bacteria can have a whole new playground in record time. Also the fact that there is no way to control who goes where makes it so that controlling the problem in one spot, doesn’t actually control it at all as it can be undone with just one person taking a vacation or business trip. This is a global issue. Which is why I think it’s great that the World Health Organization (WHO) has recently approved a declaration aimed at reducing the use of antibiotics worldwide. Some people may feel alarmed by this because of the false sense of security that comes along with a prescription for an antibiotic. They certainly seem to make things easier, but in the long run, its clear that a time can definitely come where we have no defense against a seriously harmful bacteria. How long can we outrun the mutations that are bound to happen? My guess is not very long. Decreasing the use of antibiotics is a good first step and it seems there are other ideas in the works to combat the development of resistant bacteria, such as targeting the bacteria themselves and making them less dangerous and using other organisms (like the phages) to our advantage to kill these new bacteria. If your doctor says you don’t need them, don’t try to convince them otherwise– I’m not saying that you shouldn’t ask questions and make your concerns known, or even seek a second opinion if needed, do what’s right for you. However, sadly many times patients just want something to help them. No one wants to leave the doctor without a solution, and I get that, but this too often results in patients taking things they don’t need to. A lot of the time they even end up with antibiotics for a viral infection (common cold, flu, etc.) when they have ZERO effect on viruses. And doctors are human too, sometimes they give in to the patient for any number of reasons, with all the best intentions. If you get antibiotics, finish your course completely– I’ve been guilty of this before. Get a course of antibiotics, and a couple of days in start to feel way better! So you stop taking the last few days in the course. Think of it this way. The drug killed off the weaker bacteria which is the majority, but you have to keep taking it to wear down those super strong bad ones that may have survived the first wave of attack. Finish the job. Finish your course. Don’t give them a chance to come back more dangerous than before. Don’t share antibiotics or use leftover medications- What works for you might not work for other people, and it’s just giving bacteria more chances to mutate and become better survivors. There’s no question that antibiotics absolutely changed the game and gave us a fighting chance in the fight against bacteria. They have been and still are an amazing tool in medicine, so this is not meant to alarm anyone. If you have questions don’t be afraid to ask your doctor for advice and information. If you want to read up some more on antibiotic resistance feel free to visit the WHO website.